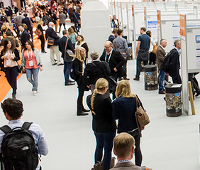 Complement your ECCMID 2019 experience with the 'Machine Learning for Clinical Microbiology' the day before ECCMID in Amsterdam. This workshop is happening on Friday, 12 April. Sign up using the ECCMID registration portal! Limited places are available, the full day is only €100! Registrations are now open for the 12th International Meeting on Microbial Epidemiological Markers (IMMEM XII), to be held in Dubrovnik, Croatia from 18-21 September. Baeza et al., Evaluate the performance of five different carbapenemase assays and develop an algorithm that will detect the most common and rare carbapenemases in routine microbiology laboratories. The immunochromatographic tests CARBA-5 (NG), RESIST-4 O.K.N.V. (Coris), the colorimetric β-CARBA (BioRad), a newly developed carbapenem-inactivation method (CIM) supplemented with zinc (zCIM) and the Xpert Carba-R (Cepheid) were challenged with a collection of 189 molecularly characterized Enterobacterales isolates, including 146 carbapenemase producers (CPE): VIM (n=48), OXA-48-like (n=40), NDM (n=29), KPC (n=13), IMI (n=9), IMP (n=9), OXA-58 (n=2) and GES (n=2). 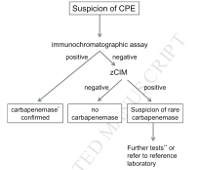 The overall sensitivity/specificity values for the five carbapenemase detection tests were 84.2%(CI 77.6%-89.2%)/100%(CI 91.8%-100%) for RESIST-4, 88.2%(CI 82.1%-92.4%)/100%(CI 91.8%-100%) for CARBA-5, 88.2%(CI 82.1%-92.4%)/100%(CI 91.8%-100%) for Xpert Carba-R, 73.7%(CI 66.2%-80.0%)/100%(CI 93.4%-99.0%) for β-CARBA and 97.4%(CI 87.9%-99.6%)/97.7%(CI 87.9%-99.6%) for zCIM. The four common carbapenemases (KPC, OXA-48-like, NDM and VIM) were detected with ≥97.6% sensitivity by all tests except for β-CARBA (76.6%[CI 68.4%-83.2%]). IMI and GES were only detected by zCIM (sensitivity 90.9%[CI 62.3%-98.4%]). Based on these results a new algorithm was developed, consisting of an immunochromatographic assay as the first test followed by zCIM, which allows detection of 99.3% of all evaluated carbapenemases. With the exception of β-CARBA, all methods showed excellent sensitivity / specificity for detection of the four most common carbapenemases. With the new algorithm, rare variants can also be detected. It is fast, simple and inexpensive and can be performed in any microbiology laboratory, no PCR equipment is required. Don’t miss out on the upcoming EUCIC local module on Healthcare Associated Infections in Bergamo, Italy. An expert faculty of experts from across Italy and Europe will address practical aspects of controlling HCAI’s in an interactive, engaging meeting. Part 3 of GARDP’s series on Antibacterial drugs is occurring on Thursday!